Before I even fell pregnant with Roo I can remember a lady I worked who was pregnant with twins coming into work to tell us all about baby sleeping bags that she had discovered over the weekend. Whilst I wasn’t a mum at that point I could see the benefits of using one instead of blankets as even I knew hoe wriggly babies could be. Fast forward to each of my pregnancies and one of the first things I bought was a baby sleeping bag for them. Over the years, I have tried many different types and brands of sleeping bags and I do truly believe that you get what you pay for. Whilst the supermarket own brand and high street basic sleeping bags do their job I don’t feel that they provide that soft, comfortable and cosy feel that I would like for myself never mind my little one. 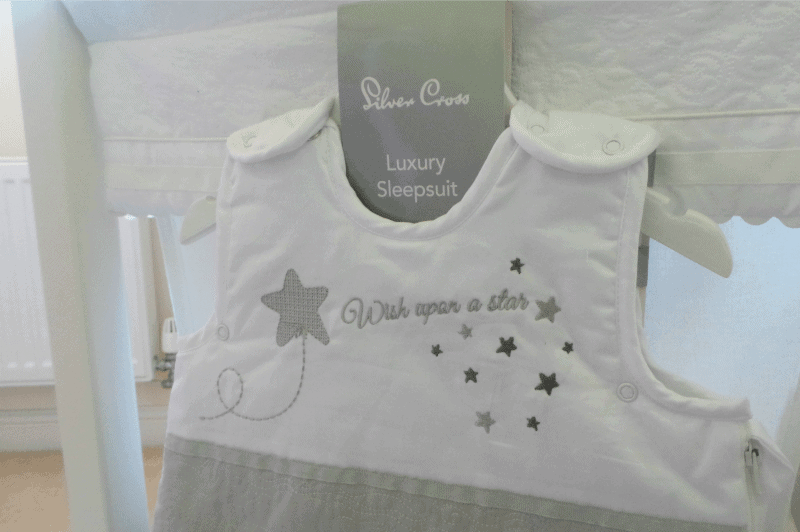 So when Silver Cross recently sent Piglet their Luxury Sleepsuit I was intrigued to see whether the slighter higher price point would provide that luxury feel that you’d expect from a brand like Silver Cross. Arriving carefully wrapped up I immediately fell in love with the white and grey ‘wish upon a star‘ design. 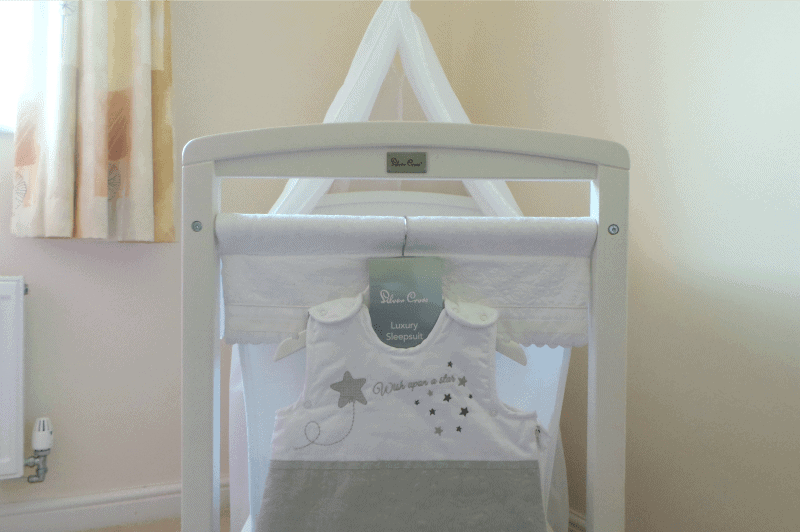 The Silver Cross luxury sleeping bag comes hung on a white wooden branded hanger adding that added touch to the sleeping bag and would make a beautiful gift for expectant parents at a baby shower. The Silver Cross Sleepsuit is suitable from birth (for babies weighing over 8.8lb) and the 2.5 tog rating provides a cosy, safer sleeping environment than using blankets. Made from 100% pure cotton with a soft touch jersey lining it is sure to feel soft against babies skin. 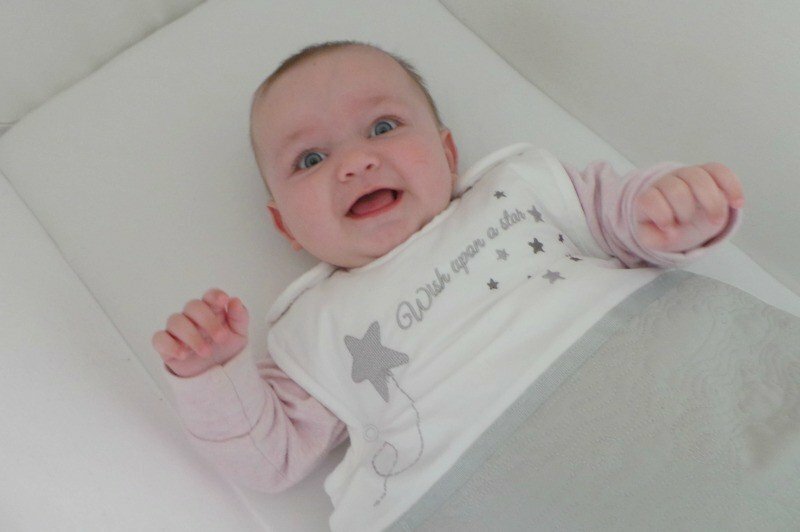 With popper fastenings to each shoulder and a zip opening, it allows you to get baby in and out easily. 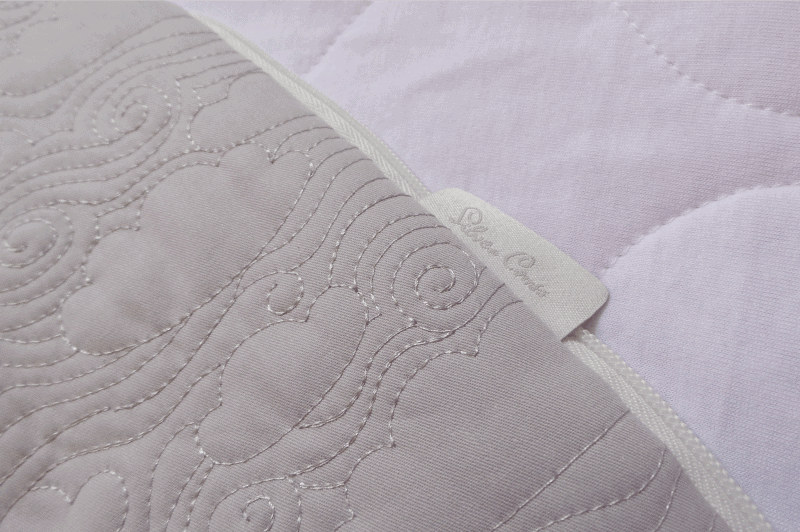 The zip opening allows enables you to change babies nappy without having to take then fully out of the sleeping bag to prevent them getting cold and disturbed too much during the night changing time. 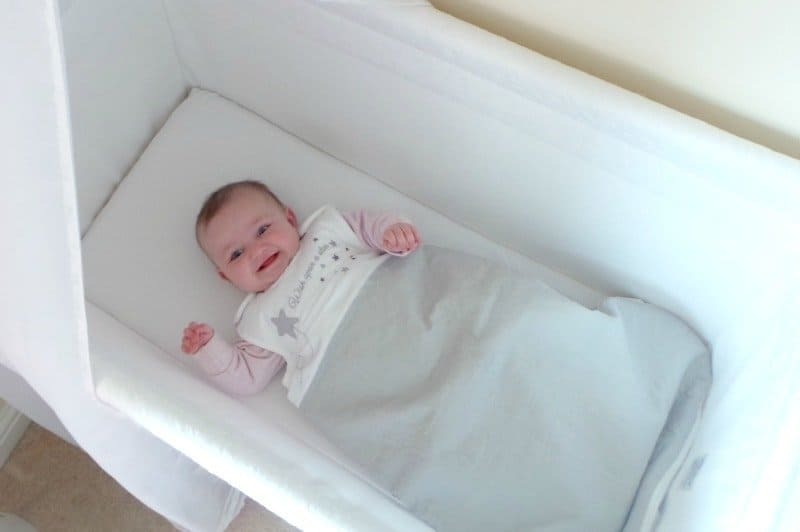 There is also the added benefit of an additional popper either side under babies arms to prevent littler babies arms from slipping into the sleeping bag. Piglet is a little over five months old and these poppers still fasten up and give her that added support and cosy feeling around her chest. I have to confess that I have learnt the hard way about purchasing cheaper makes of baby sleeping bags over the years, they are only good for the first few washes and after that, they become lumpy and misshapen. The Silver Cross Luxury Sleepsuit, however, is certainly worth its £30.00 price tag. Piglet tends to wear a sleeping bag for two nights running (if we are lucky) before it is placed in the wash, dried and then ready for its next use so I need something that is going to withstand frequent washes as well as everything that Piglet throws at it too. The Silver Cross sleeping bag has washed beautifully, it is not suitable to be placed in the tumble drier, however, dries quite quickly on the washing line and even hung up on a hanger in the airing cupboard on damp days. Piglet seems to be comfortable and cosy in it as you can see above, this is her waking from her nap – can’t beat walking in to find a gummy smile like that. Oh, I’m a sucker for anything with stars- this is beautiful- and I’m loving how happy Piglet looks in it. I’m with you, I discovered the hard way that you do need to pay for lasting sleeping bags- with twins I thought I’d spend the same money but buy two- more fool me. I ended up with a similar price bracket in John Lewis- but they completely lack the beautiful design- and who could argue with a brand with the reputation of Silver Cross!